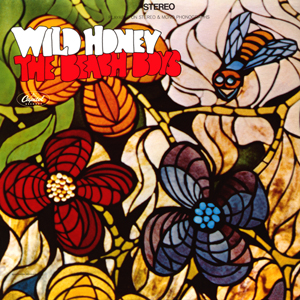 This review concentrates specifically on the STEREO remasters of the tracks from the often maligned and overlooked "Wild Honey" album. The STEREO remastering is superb and transforms the album. Up there with the best ever remasterings of sixties music. Coming after the abomination that was "Smiley Smile" and its half baked, often disturbing puerility, it comes as a blessed relief to hear a PROPER track in kick off the album "Wild Honey". The track is admittedly unusual, innovative an experimental, but at least it is a full creation, unlike the tosh served up on "Smiley Smile". "Aren't You Glad" continues the album in its organ, bass and brass 60s fashion which led many to say this was The Beach Boys' soul album, an impression continued with a belting cover of Stevie Wonder's 1967 hit "I Was Made To Love Her". The new thing of "country rock" is experienced in the pleasing "Country Fair" as they go all Byrds. "A Thing Or Two" is pure late 60s pop/rock, with some jazzy parts for good measure, using the riff later to be used on "Do It Again". These five opening tracks show clearly that the drug-fuelled, irritating excess and lack of finished product on "Smiley Smile" was put firmly in the past. Just listen to "Aren't You Glad" and you realise The Beach Boys are back on solid ground again. It is a much-underrated track in their canon. 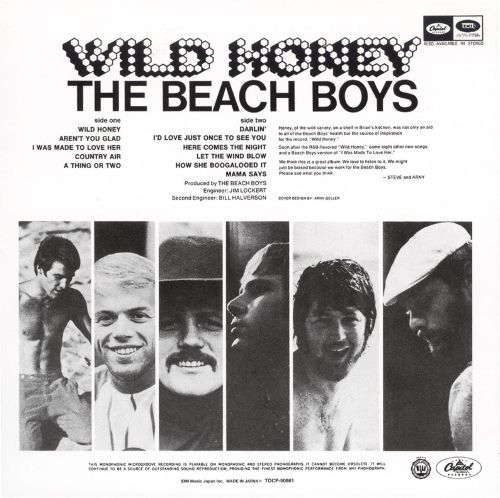 "Darlin'" is classic Beach Boys and deservedly is on every "Greatest Hits" package. "I'd Love Just Once To See You" is as beautiful as anything on "Pet Sounds". "Here Comes The Night" with its beautiful bass line and "Let The Wind Blow" continue in the same vein. The former would have made a great single, in my opinion. The latter is an example of how many of the "semi songs" from the "Smile" sessions should have ended up. "How She Boogalooed It" could be from 1962-65 in its "surfy" rocking feel. Beautifully upbeat. Things are fine again. Maybe. Give me this over "Smiley Smile" any day. No comparison. They are light and day apart. One is an unlistenable disgrace. The other is a welcome relief and most enjoyable. Proper songs. Thankfully.